The following documents provide the information you may need in order to plan your event using our facilities. 401 West Vine St. / Corner of Short Street and North Broadway, Lexington, Kentucky. Street (Across from Railroad Garage). CL to SR Wall: 30’-0”. A complete set of black masking goods, sewn flat, is available. Also included in the soft goods inventory are 1 white scrim, 1 black scrim, 1 cyclorama drop (white) 2 blackout drops, a midstage and an upstage traveler (black), and the house main curtain and valance, which are red velour, sewn with 100% fullness. Travelers are used as masking legs when in their fully open position. Loading Door: UC Wall of Stage; 10’-9” wide x 14’-7” high. A portable dock extends from loading door to alley behind theatre for ramping equipment into theatre. 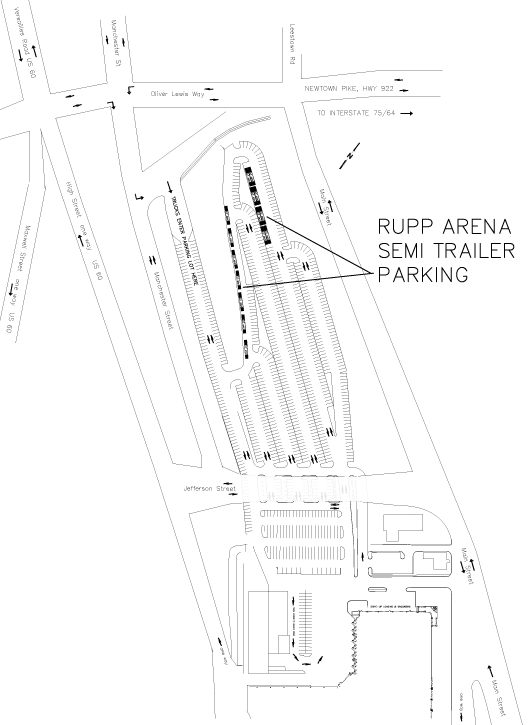 R1: to immediate right of Stage; 35’ x 45’ with oak floor, for storage or rehearsal. Cross over location from the basement dressing rooms. Tech Room: to left and across hallway from Stage; 20’ x 30’ can be used for dimmer rack placement, storage. Hallway fire lane must be kept clear. R2: One level up. 4 Star (1-3 Person) Dressing rooms with individual shower and toilet facilities. Also has small “green room” area that can double as production space. Dressing Rooms: In basement below stage; 2—26 person Choral Dressing Rooms. Each one has individual make-up lights, sinks, toilets and showers. Green Room: In basement below stage; has necessary electric service to function as wardrobe area; Orchestra pit at its lowest level is accessible from here. Also has access to SR. Laundry Room: in basement. There are 2 washers and 2 dryers available. Additional wig room available with notice. The house main curtain (lineset #2), will fly out to 46’-0”. The bottom of the main curtain is then 21’-5” above the stage. Linesets 4, 11, 13, 16, 19, 26, 31, 32, 35, and 38 have long (8’) arbors. All other linesets have short (6’) arbors. The first electric and cyc electric are not included in the above 40 linesets. They are box trusses which run on chain motors. The first electric is located between lines 4 and 5. The cyc electric is located between lines 36 and 37. * Low trim for all battens is approx. 4 feet. * All arbors are rated to handle more weight than can realistically be loaded. For practical purposes, short arbors can be loaded with approx. 760 lbs. beyond pipe weight and long arbors can be loaded with approx. 1160 lbs. beyond pipe weight. If this is insufficient, battens can be married together and/or block and falls used. DigiDesign (Avid) Venue, D-Show Profille 48 input FOH Console. Monitor Console available on request and with advance notice. L’Acoustics Kudos Series Line Array cabinets with LA8 and LA4 amplifiers. There is a left and right own array of 6 for coverage for Balcony 1 and 2, and a left and right floor stack of 3 for coverage of the orchestra level. 9 Kudo’s per side. 2 Permanently mounted monitor speakers are hung overhead left and right of stage on tracks for optimum positioning. 4 L’Acoustic 8XT front lls. 10 monitor wedges (8—L’Acoustics 12XT and 2—115XT) with 6 amp channels available for Monitors. L’Acoustics LA4 amplifiers power Monitors. Paging system to all backstage areas, including dressing rooms, is permanently installed; mic and line levels can be patched to this system via XLR connectors located backstage @ DR & DL proscenium walls. A House 2-way splitter available. Clear-Com system with 8 stations; more available on request; 3 available channels to all locations. Listening devices for the hearing impaired and audio descriptive devices for sight impaired are available. FM transmitters will accept mic or line level input. A large assortment of microphones and playback devices is available on request. House Control Equipment: ETC ION 2000 Lighting console. 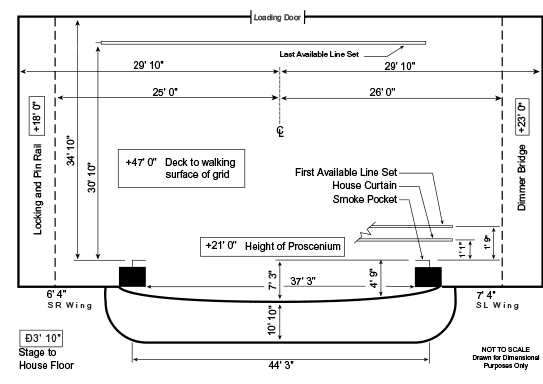 Balcony Rail with 35 circuits, transferable; throw is 52’. House Beam with 36 circuits, transferable; throw is 60’. Balcony Rail has 25 – 19 degree ellipsoidals @ 750w. Box Boom positions do not exist in the house and there is no place for booms to be placed temporarily; however, the extreme ends of the balcony rail can be used for placement of box boom lights if so desired. There are 8 drop boxes (84 circuits) stage left and 24 circuits stage right for powering electrics. Any of the drop boxes can be clamped to any batten or boom. Additionally, there are 40 circuits at the dimmer gallery stage left. There are six LED cyc lights hung on a box truss between lines 36 and 37. This truss is raised and lowered on chain motors. Six ground row LED cyc lights are available. The cyc fixtures are Chroma-Q Color Force 72”. They currently run RGBA, and wash 36’ of cyc. Plus 6 drop-in irises, 10 donuts for 19-50 degree instruments, 5 donuts for 10 degrees, 2 donuts for 5 degrees, 5 spare 10 degree barrels, and 5 spare 5 degree barrels. If your plot will use all of the listed fixtures, please confirm their availability. Sometimes things break. Spots have the “push/pull” boomerang. 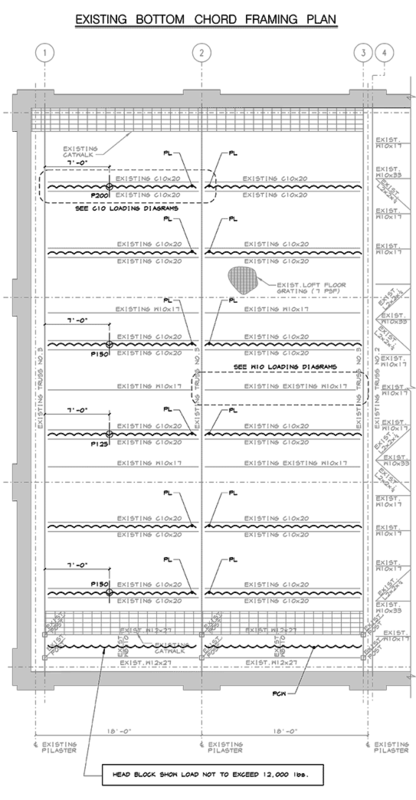 Right rear of center section on Orchestra Level (main floor); platform is 8’ deep x 12’ wide; can be expanded to 8’ deep x 24’ wide by removing house seats. Mix platform is 63’ from proscenium. Cable run to Backstage Right is 125’. Tie-in to house system is via XLR connectors located backstage @ DR proscenium. FOH Snake Cables can also run Backstage Left as show requires (150’). Four (4) Star (1-3 Person) Dressing rooms with individual shower and toilet facilities. Also has small “green room” area that can double as production space. Located one level above the stage. 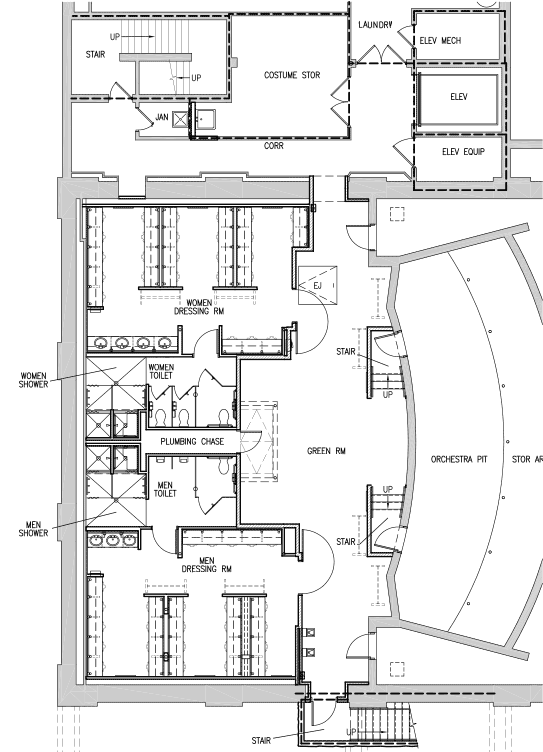 Two (2)—26 person Ensemble Dressing Rooms. Each one has individual make-up lights, sinks, toilets and showers. Located one level below the stage. The Opera House in Lexington, Kentucky was built in 1886 and renovated in 1976. Throughout most of its existence, it has served the community as a venue for traveling attractions. As Broadway touring shows have gotten bigger and more complex, the staff at the Opera House, in conjunction with touring show crews, has devised solutions to some of the challenges that have arisen over the years. For the majority of theatrical productions touring today, the Opera House can be a workable venue without sacrificing the quality or quantity of the show’s scenic elements. Following is a list of challenges, and the solutions that have been employed to overcome them. Grid Height—48 feet: Roll or trip drops. The Opera House has enough hardware in stock to roll at least 8 drops. Most touring shows that have used this method of shortening drops have found it effective without compromising quality. The maximum visible trim height at the Opera House is 21’-6”, so if you have a 25 to 30-foot drop, the top 5 to 10 feet will not be seen by most of the audience. As an example, say a drop is ten feet too long to fly out of view. The top five feet of the drop is folded over onto itself, then rolled onto 1”x 4” boards. The boards are then attached to the pipe using wooden clamps. This procedure has been used for scrims, translucent drops, and even fiber optic drops. The logic holds that if a drop can be folded for storage, it can be folded for rolling on batten boards. If an open lineset is available immediately upstage of a drop, it can be used as a trip line to pick up the bottom of the drop and fly it out of view. In many cases, however, a second lineset is not available. Some touring show carpenters have used a method of self-tripping a drop which requires only one working pipe per drop. Typically, three trip lines attach to the bottom of the drop on the upstage side, go up through sheaves attached to the working pipe and then run offstage to the end of the pipe. At that point they run through a multiple sheave block and down to the fly rail, where they are tied off. As the pipe flies out, the trip lines automatically raise the bottom of the drop at twice the speed of the batten pipe. The pickup lines on a piece of hard scenery can be choked for shorter length and clove-hitched to the pipe, then secured with Crosby clamps. The batten pipe can be masked with soft goods for low trim. Another method of gaining more clearance is to rig the piece to the pipe at a point lower than the top of the piece of scenery. The grid steel is four feet higher than the maximum trim height of our short arbor pipes, and eight feet higher than high trim for the long arbor pipes. As long as the pipe will be hidden behind the scenery and not visible to the audience, this method of rigging can gain a considerable amount of trim height. Offstage wing space: The large roll-up doors located down left and right (see plan view 4) can be utilized efficiently for moving large set pieces off stage as long as they are under 14’-2” tall and less than 10’-6” wide. The room stage right has a storage area of 47’ x 35’ and the room off left has storage space measuring approximately 20’ x 30’. In order to use these areas for scenic storage, most empty crates, meat wagons, hampers, etc. will need to be stored elsewhere in the building or reloaded onto trailers. Storage Space: There is a large storage room on the third floor backstage, accessible by a freight elevator that is 6’-1” wide x 9’-8” deep x 6’-8” high. The stage left storage room is often used for dimmer rack placement, which makes it difficult to store large scenery units there. But if the dimmer racks are located in the far upstage portion of the room, then a large rolling unit can easily move off stage into this room. If the 600-amp disconnect (located onstage by the stage left rollup door) is used for dimmer power, 60’ of feeder cable will be needed to reach the dimmer racks in this location. If the 400-amp disconnect is used for dimmer power, less than 25 feet of feeder will reach the dimmers, as this disconnect is in close proximity to the dimmer rack location. Multi cable may also need to be extended, depending on the length of multi used by the show and the length of any multi extensions the show is carrying. There is also an upper deck just above this area that can be used as the control station for lighting, thereby freeing up more space in the room for scenic and prop storage. Please note there is a hallway between the stage and the off-left storage room that serves as an emergency exit from the theatre, and a fire lane against the wall must be kept clear and open at all times. Proscenium width and masking problems: The proscenium wings at the Opera House can be swung open to create a much larger opening. However, masking is difficult when this is done. To compensate for this, we have permanently hung two steel pipes, one on each side of the proscenium, to which we attach a set of our house black legs. The legs hang in the same plane as the proscenium, and can be used to adjust the proscenium opening from 36’ to a maximum of 42’. 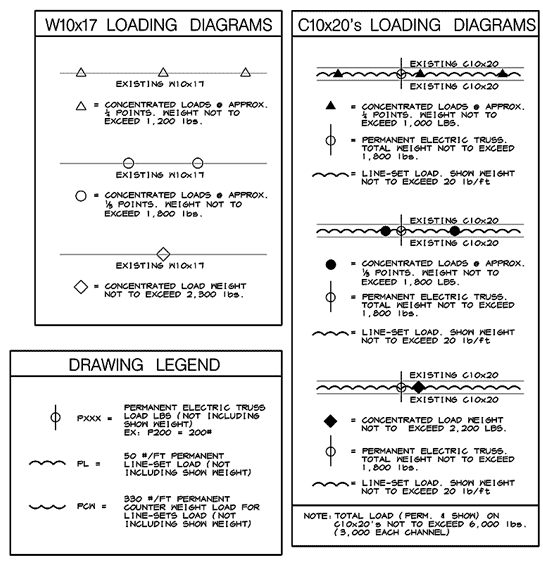 If lineset no. 3 is used for masking, it can be extended on either end by as much as three feet (it is the only pipe with enough offstage clearance to do this) so that masking goods can extend further offstage. On all other pipes, short extensions can be added (18” or less) for masking goods as long as the pipe does not move during the show. If the show carries its own soft goods for masking, the house black velour legs can be hung as side maskers running up and down stage from the two gallery rails on each side of the stage. If side masking would interfere with set pieces moving on and off stage, a stagehand can breast them aside as needed. If necessary, additional hands can be added to the show call to accomplish this. For upstage masking, the show must accept the fact that the theatre has very little wing space. The house black soft goods, including a 20’ x 50’ blackout drop, can be used if additional masking is needed to conceal the upstage areas from view. Again, the availability of the house goods would be determined by whether the show has its own masking goods, or uses the house goods. Sightline problems caused by P.A. towers: By swinging open the hard proscenium wings, a larger footprint area is created for setting P.A. stacks. However, the balcony boxes are only eight feet above the stage floor at this location on each side of the stage, so P.A. stacks higher than eight feet will obstruct the view from these seats. In some instances, the show’s sound engineer has either left off the upper part of the stack, and stacked it next to the lower part, or used the house line array to cover the balconies. These solutions have proven themselves worthy on many occasions. However, new challenges arise every season and we are always eager to work with the touring show staff to find new solutions. If your show has particular needs or problems that should be addressed, please call the Technical Services department well in advance of your show dates. We will be glad to assist in making your visit to the Opera House a successful one. 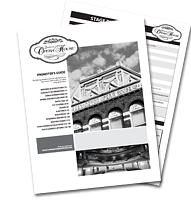 In accordance with Section 14.97 of the Municipal Code of the LFUCG, the Lexington Center Corporation/Opera House is a smoke-free facility. Additionally, LCC prohibits the use of E-cigarettes inside its facilities. With approval of the CORPORATION in writing, an area may be designated as a smoking area for private events. There is no free parking in lots owned and operated by CORPORATION. Parking on the circle at the Short Street entrance of the Opera House is reserved for LCC staff only. As posted, vehicles without valid LCC permits will be towed at the expense of the vehicle owner. Licensee is responsible to inform all event participants of this policy. LCC will not be responsible for towing charges for unauthorized vehicles. A five-percent (5%) convenience fee will be added to deposits and settlement charges paid by credit card. A fifteen percent (15%) administration fee will be included on all equipment rentals beyond the inventory of the CORPORATION made at request of LICENSEE. LICENSEE (or exhibitor) is responsible for the security of items in meeting rooms and exhibit areas. CORPORATION shall not be responsible for damage or loss of property. The use or distribution of lighter than air gas filled balloons is prohibited without prior approval. Approval would require a signed waiver of responsibility for costs associated with removal of said inflatables. Other common event decorations that require advance authorization include but are not limited to candles, glitter and confetti. Additional fees may be incurred for cleanup of these items. Attachment of signs, display materials, decorations, etc. to wall surface, windows, lectern or drapery is prohibited. The hanging of signs and banners from ceilings must be approved and installed by CORPORATION personnel only as an Ancillary Service. Pets are prohibited with the exception of those authorized by CORPORATION due to the nature of the event. Exhibits using water features are prohibited in carpeted areas. The sale, service, or distribution of food or beverage products is an activity that is restricted to those licensed by the CORPORATION. This includes, but is not restricted to, food/beverage items used as traffic promoters in trade shows such as coffee, popcorn, sodas, bottled water, bar service, etc. Trade Show vendors may request authorization to sample food items specific to their business by submitting the Food Sampling Authorization form to CORPORATION prior to the event. Vendors requesting permission to sell food items must submit the Food Sale and Distribution Authorization form for CORPORATION approval. Should approval be granted these vendors are subject to a $5/day food vendor fee. Receptions: a (pre-show, intermission, or post show) reception in (Pardy’s Pub, Level 3 Gallery, Level 2 Lounge, Backstage R-1) may be allowed for up to one hour. LICENSEE may provide food and/or outside catering with the following exceptions: alcoholic beverages must be provided through the CORPORATION with all costs borne by Licensee. Cooking on site will not be permitted at any time. Food preparation is not permitted in carpeted areas. Possession, distribution and consumption of alcoholic beverages is prohibited except through properly authorized vendors. CORPORATION, at its discretion, may require full payment of estimated host bar costs one week prior to event. Events seeking an alcohol sponsor must discuss this is advance with their Sales or Event Manager to ensure steps are taken to adhere to Kentucky Revised Statutes governing the sale of alcohol. As stipulated by KRS 243.036, the auction of any alcoholic beverage requires a temporary permit issued by the Alcohol Beverage Control Board. The application process takes 30-45 days to complete. A permit must be presented in order for the item to be sold. For further details and the application, please contact the ABC Board at (859)258-3796.
possession is authorized by exceptions listed in the Act or as authorized by the Commonwealth of Kentucky. Use of the Facilities for a trade show or public exhibit purposes requires a detailed floor plan depicting the intended use of the area. Floor plan will be submitted to the CORPORATION for review and approval by CORPORATION and local fire marshal where appropriate. Displays located in corridors shall be located to one side, leaving an approved clear walking path. 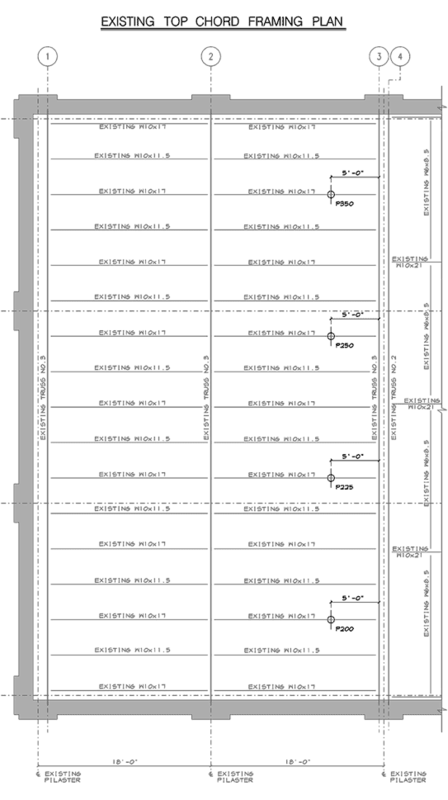 Approv-al of plans shall be obtained prior to sale or allocation of space to potential exhibitors. Rigging plans must be submitted for approval for events that require equipment in excess of 100 lbs. to be suspended from the ceiling. Rigging of AV equipment and/or production equipment must be performed by CORPORATION staff or its authorized representatives as an Exclusive Service. Any use of open flames or smoke generating substances or equipment must receive prior approval. LICENSEE agrees to make all production elements, decorations and construction materials non- combustible or flame retardant according to the National Fire Protection Association Code and any applicable local Fire Department Regulations (documentation is required). This includes, but is not limited to, organic decorations such as mulch, hay bales, etc. Treatment must occur prior to delivery to the Opera House. The Opera House Staff and the LFUCG Fire Prevention Bureau reserve the right to perform a Flame Test on any Production Piece to verify flame retardant properties (applicable fees will be bharged to LICENSEE). The Opera House and/or the LFUCG Fire Prevention Bureau can disallow any production element that is either not flame retardant or contains material that could be considered unsafe. Electrical devices must be installed, operated, and maintained in accordance with manufacturers’ intended use and applicable codes. In any case, electrical devices that create a hazard to life or property are not permitted. • Fuel supply limited to that necessary for installation and removal of equipment. • Fuel tanks must have pressure released by removing fuel cap after vehicle has reached display position, and then the fuel cap must be locked or sealed. • Electrical power supply must be disconnected. • Keys must be removed from ignition and will be retained at CORPORATION Security Headquarters. • Motor vehicles are prohibited in carpeted areas, unless under the direction of CORPORATION management, to take precautions for protection of CORPORATION property. • Any use of motorized vehicle in the Facilities is subject to prior approval of the CORPORATION. Use of motorized vehicles during public occupancy of Facility is prohibited. • Compressed gas cylinders must be firmly secured in an upright position. • Propane storage tanks may be no larger than 5 pounds per booth. • Booths using propane shall be located no closer than 100 feet apart. • Additional propane tanks must be stored outside of the building. • Food preparation is not permitted in carpeted areas. Please contact the Lexington Fire Prevention Bureau if you need further information or clarification. 859-231-5602 (phone) or 859-231-5606 (fax). to the Opera House Technical Director in advance of load-in, for any event involving minors in the production. At least one adult representative [SUPERVISOR] from the Licensing organization must be named and positioned at the stage door to be present and responsible for supervision, prior to minors’ entry into the building, throughout the duration of minors’ participation and until the last minor has vacated the premises. A “point person” [CLIENT REPRESENTATIVE] should be named as secondary contact. (i.e. production supervisor or main technical contact for the LICENSEE). LICENSEE must provide the name, title and both email address and cell phone number of SUPERVISOR AND CLIENT REPRESENTATIVE for the entire schedule prior to load-in. The entire schedule, along with names and contact information should be available at the tech office throughout the engagement. Any modifications to the schedule or supervisory person-nel should be documented with the Opera House Technical Director, plus applicable fees will be charged.